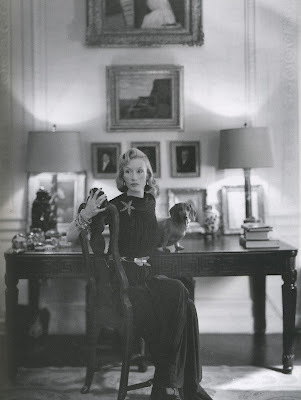 Standard Oil heiress Millicent Rogers at home with one of her several dachshunds. Photograph by Richard Rutledge for American "Vogue," 15 March 1945. Most people simply pound a nail into a wall when they decide to display a photograph or a painting. Sadly, however, that's where those framed treasures usually stay for time immemorial, often losing their power to attract the eye through daily familiarity. But leaning a work of art against a wall rather than displaying it conventionally on the wall is always more interesting. (And I'm not talking about utilizing those narrow picture shelves popularized by mail-order catalogues.) Casual placement on tabletops, mantles, even the floor, is curiously potent. It implies a certain dégagé attitude toward the treatment of one's possessions as well as, conversely, a sense of deep attention to the intended effect. Even if the work of art in question isn't particularly compelling or valuable, propping gives it more gravitas. Plus, this kind of deployment allows works to be moved around at will without resorting to a hammer. The impossibly stylish Standard Oil heiress Millicent Rogers, shown above, propped several giltwood-framed paintings on a Greek-key-ornamented desk in her living room in the 1940s. Curiously the table lamps partially obscure the art, tempting one to step forward and take a closer look. (Sometimes great design is about seducing others to experience the world way you do.) The leaned pictures also break up the formality of the installation, loosening the stays, as it were, of the matching lamps and the symmetrical display of nineteenth-century paintings on the wall above. Tastemaker Pauline de Rothschild, another charter member of the propped-art school, often displayed a small Bonnard painting on a chair carefully placed at her bedside, so it was the first thing the American-born baroness saw when she woke. Precious, but why not? Real style embodies a certain amount of idiosyncrasy. A great friend of mine, a lady of highly evolved aesthetics, has set a beautiful representation of a flower — I'm sure it's an antique, a Redouté perhaps? — on the floor of her spare but perfectly decorated sitting room overlooking the East River in New York City. The rather small artwork, no bigger than a standard magazine cover, is beautifully framed and placed so low and with such modesty that coming upon it is a delightful surprise. Seeing it out of the corner of one's eye, leaning against the baseboard, is like a gift.